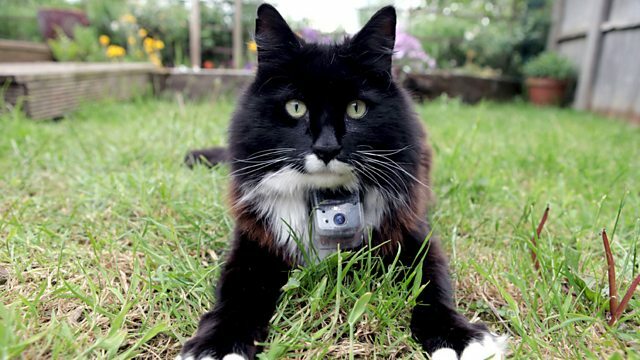 Horizon discovers what your cat really gets up to as 50 cats from a village in Surrey are tagged with GPS collars and their every movement is recorded. The cats are also fitted with specially developed cat-cams which reveal their unique view of our world. How well do we really know our cats? Dr John Bradshaw has written over 100 research papers and book chapters on the behaviour and welfare of domestic cats and dogs, and their relationships with people. Our GPS units can decipher the positions of the cats to within tens of centimetres, while lightweight cat cams record their every move. Adult cats that live in the wild rarely purr at all, so why do our domestic moggies purr so much? Helped by her own cat Pepo and some human volunteers, Dr Karen McComb led research to find out. Our cats’ behaviour surprised the experts.They were expecting a lot more tension between six cats in one household.